The Three Faces of Eve, the true story of a woman suffering from multiple personality disorder, debuted at an interesting crossroads. Released in 1957, as psychiatry was growing both in terms of practice and social acceptance (relatively speaking), the film makes strides in examining the work of mental health doctors, as well as taking an inquisitive, non-judgmental approach to sufferers of mental illness. While we have passed the days of Spellbound, which required a lengthy introduction to the very profession of psychiatry, we are still presumed to be so faintly acquainted with the possibilities of mental illness, the film enlists the aid of “distinguished journalist and commentator” Alistair Cooke to attest to the veracity of the story we are about to see. “This movie needed no help from the imagination of a fiction writer,” he tells us in a direct address. Through his introduction, Cooke indicates the overall tone of the film: sensitive to the nature of the story, but always aware of its sensationalistic value as a movie. On one hand, The Three Faces of Eve is a prestige picture. Like so much other Oscar bait before and since, it is the story of a brave woman in peril, suffering from a disease that tears her apart from her family. Starring the fresh-faced Hollywood newcomer Joanne Woodward, the role required extraordinary range – three fully fledged characters all inhabiting the same body. Woodward sinks her teeth into the meaty role, which allows her to shift from demure, powerless Eve White to the sultry, vampish Eve Black, and finally to the rational, “true” self of Jane. The film also depicts the sincere efforts of the competent and humble Doctor Luther (Lee J. Cobb) to help his patient. Through exhaustive sessions, often employing somewhat unorthodox techniques like hypnosis, Luther cracks the case of Eve’s disorder and helps her to live a normal life again. The exploitative aspects of the film are mostly driven by the appearance of the lusty alter ego Eve Black. Almost like Roger Corman schlock of the time, the film delights in the transitions from Eve White to Eve Black, needlessly punctuating each conversion with an achingly obvious hot jazz score. That said, the movie is at its best when Eve Black is around, scandalously flirting with every man she sees, wrapping most of them around her finger. Aware of the timid life Eve White lives in their shared body, Eve Black relishes the power she holds over men, eventually building to a shocking scene in which she conquers her own husband, who is aware of this alternate personality and yet can’t resist it. That the film works best as an exploitation movie is a testament to just how bad a prestige movie it is. Stunted by an utter lack of visual attention, moving slowly through one long master shot after another, the film never finds any momentum. In a movie that begs for rich close-ups and stylistic angles, director Nunnally Johnson and cinematographer Stanley Cortez take a hands-off approach, leaving us mired in sterile, static shots. It is worth noting, though, that the seeming absence of any direction at all only makes Joanne Woodward’s amazing performance that much more remarkable, as she seems to have created it all on her own. 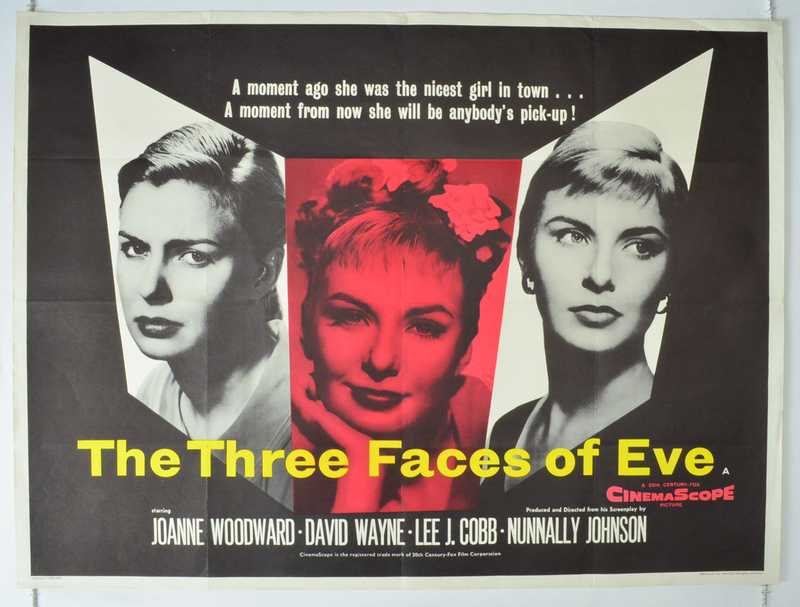 The line that The Three Faces of Eve tries to skirt, between being both a sympathetic treatment of illness and an exploitative shocker about a woman gone mad, likely ensured its success in both mainstream and youth-targeted movie theaters. However, it was also a signal that, while psychiatry was gaining wider access and acceptance, mental illness was still an easy tool used to shock and captivate American audiences. Next week, Daniel Barnes will review Sidney Lumet’s 1977 adaptation of Equus, a film that has an even more shocking depiction of mental illness, and another psychiatrist-hero trying to solve a mystery. “Self-important dud”, indeed yes. And a film with the creepy taint of the Actors Studio.